There are several groups (see for example Landberg et al (2003), Martf (2000), Moehrlen (2000)) working in this area and they all have slightly different approaches. However, in all cases, the creation of power output forecasts is a two-stage process. First, there is the creation of site-specific meteorological forecasts (for some predefined reference point, such as a site met mast). These meteorological forecasts are then transformed, via site-specific power models, to power output forecasts. This process is shown schematically in Figure I.2.13. 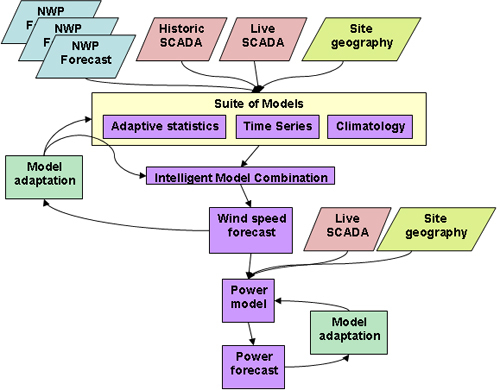 To enable the meteorological model to be both auto-regressive and adaptive, feedback data from the site is also required. In other words, the method needs to know what is happening at the site where predictions are being made, as well as using the forecast. If it does so, it can ‘learn’ and also can adjust the forecasts, depending on the degree of success.